The Golds Gym Performance Fuel - Orange is a delicious orange flavoured formula containing creatine and L-glutamine, as well as carbonates and electrolytes to provide optimal hydration and performance. This means that you can train up to and beyond your normal limits! Gold's Gym Performance fuel contains a unique blend of different ingredients including creatine and L-glutamine, designed to increase performance and hydration during intense training, so that you can push yourself harder, for longer. Creatine is used to produce muscular energy, and increase muscle cell volume to improve strength and endurance. Creatine has been a tried-and-tested supplement for lean body mass gain success for over 20 years now! Meanwhile the L-glutamine, being the most abundant free form amino acid in the body, plays vital role in muscle tissue repair (your body already produces glutamine, but not in a great enough quantity to meet demand during exercise). Therefore, extra sources of L-glutamine are vital for effective repair and recovery. So you can train safe in the knowledge that you'll be able to hit the ground running again tomorrow, and the day after, and the day after. 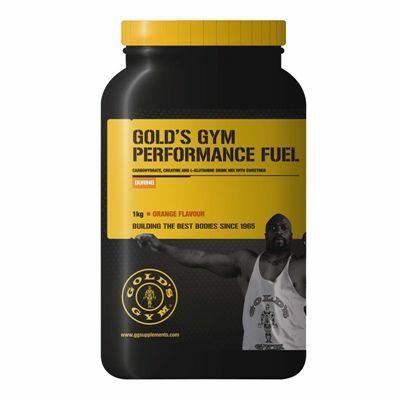 for submitting product review about Golds Gym Performance Fuel - Orange Flavour.